The luxurious Madikwe River Lodge is settled on the banks of Groot Marico River inside the diverse Madikwe Game Reserve, located in the North West bordering Botswana. A trip to Mkhaya is a trip into Real Africa - a soul enriching, quality experience you'll never forget. This elegant lodge is the ideal getaway for honeymooners, couples and families wanting to experience 4-star accommodations, gourmet cuisine and the ultimate in "Big Five" game viewing. 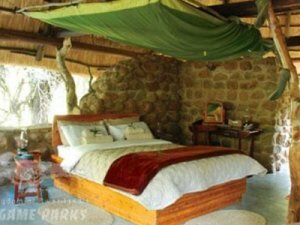 Mopane Bush Lodge is a luxury Safari Lodge in South Africa that offers a relaxing and amazing stay. Motswari Private Game Reserve, located within the Timbavati and Umbabat Private Nature Reserve, stretches out over 150 square kilometres. Motswiri Private Safari Lodge lies hidden in the bush, an exclusive lodge offering a maximum of 10 people a bush experience which is impossible to replicate in larger concerns. Discover the unique beauty of this mountain range in the Klein Karoo and allow nature to refresh mind, body and soul.